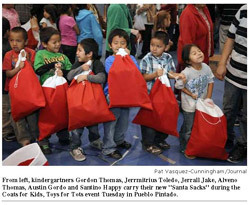 This story was published in the online edition of the Albuquerque Journal, ABQJOURNAL.COM, on December 15, 2010. Reposted by NRC with permission. PUEBLO PINTADO — In this isolated Navajo area, residents struggle year round to make ends meet, but this Christmas season they got a helping hand from several charities. On Tuesday morning at Tse' Yi' Gai High School, hundreds of kids from two elementary schools and a preschool were bused in to receive holiday gift sacks filled with toys, activity books, coloring books and crayons, stamp sets, cards, notebooks, water bottles, toothpaste and toothbrushes, stuffed animals and candy. The gifts came from National Relief Charities, an organization that helps Indians on reservations, especially in remote areas. The community the kids come from has very high unemployment, as much as 50 percent. Some homes in this area don't have running water or electricity. Although Santa Claus was the star of the show, there was an elf in the background who made the whole thing possible. Dale Williams, a custodian at the high school, said he has organized similar events with his group, Helping Helps, for the past eight years, starting when one of his children was attending the nearby Ojo Encino Day School. "Our heart is to feed and clothe the world," Williams said. "If there's a need, it's up to all of us to help and fulfill those needs." This was the first year the high school hosted the event. Tse' Yi' Gai Principal Christopher Spade said he was glad to have elementary schoolchildren come visit the high school in an area where academic achievement has been low. "We want kids to come here," Spade said. In addition to the gift sacks, the New Mexico National Guard delivered 250 winter coats donated by KOAT-TV as part of its Koats for Kids charity drive. And there was even something for parents, with red-and-white Christmas stockings filled with soap, deodorant, shampoo and conditioner, paper towels, emergency blankets, drink mix, apples, peanuts, candy, Frisbees and school supplies. National Relief Charities public relations manager Helen Oliff said her group wanted to help this area because local organizers like Williams were so focused and prepared to do whatever it took to pull off the event. "Our mission, overall, is to help improve quality of life for the Native Americans who are living on the reservation. We do that by creating opportunities for them to bring about positive change," Oliff said. "So, we see that yes, the children are getting gifts, and that brings a lot of holiday cheer. ... But it's also capacity building for the community. It's a chance for them to come together as a group for a common goal."